Find a mirror, look at your reflection, and remind yourself that you exist. Now, imagine a world that shut you out so completely it made you question that basic fact. 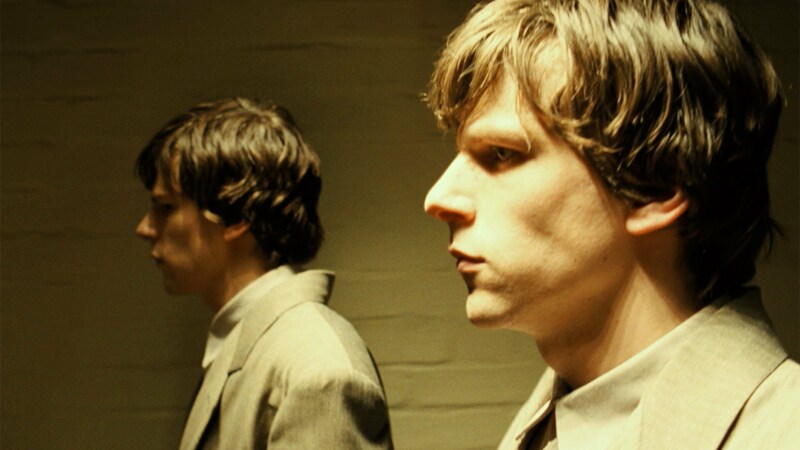 This is where writer-director Richard Ayoade takes you in The Double. The film is an utterly surreal marvel, a comedy so dark it’s equal parts exhilarating and horrifying. Ayoade transports the viewer into a visually stylized alternate universe. He frames this stark otherscape in dim yellow and gray hues. Anachronisms abound, from frumpy suits and subway trains to antiquated televisions and computers. These conflicting elements maintain the uniqueness of the setting as they further the innate oddities of the story. The film is immensely charged in its strangeness. It also gleefully refuses to explain its own rules. 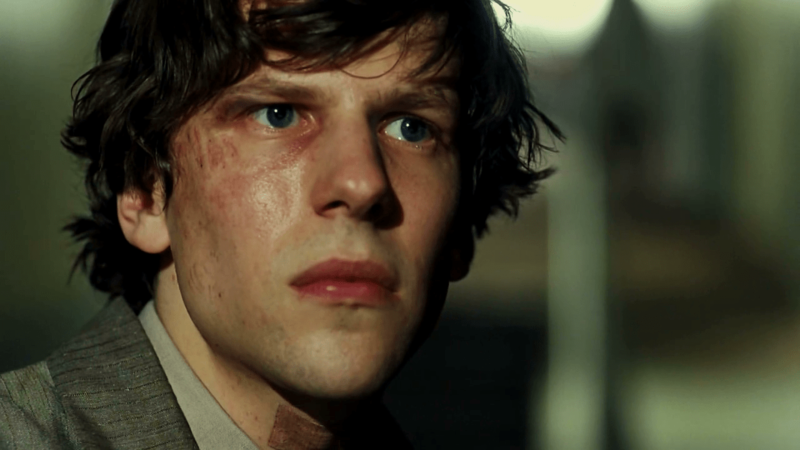 One certainty is that life is hard for Simon James (Jesse Eisenberg). Unappreciated and essentially unnoticed, his plight is the film’s bleak running gag. Simon works for a boss who after seven years still calls him “Stanley.” He can barely bring himself to speak to the girl he likes and even his own mother addresses him with scorn. How could it be worse? The answer arrives in the form of James Simon, a man who is both Simon’s physical doppelgänger and emotional opposite. James is everything Simon isn’t: suave, confident, and assertive. He quickly wins over Simon’s boss and love interest. But the worst of it? No one else recognizes that Simon and James are identical. Eisenberg plays both roles through some seamless cinemagic. He inhabits the entirely different personalities with equal verve. James’ charisma is unyielding. Simon’s inhibitions are hauntingly binding. The actor more than fulfills his dual responsibilities. He realizes the mischievous charm of a man assuming another’s identity and the deteriorating psyche of a man whose life is being sharply ripped from beneath him. Simon and James may share a singular likeness, but Eisenberg’s performance is nuanced enough that we may well be watching two different men. The entire cast is strong, although the structure of the story leaves most of the other players underused. Mia Wasikowska is the exception. She makes Hannah more than just the object of Simon’s largely unrequited affection. She inhabits the film’s visceral loneliness. Even when her arc hews too closely to the script’s larger designs, Wasikowska’s acting always feels authentic. The same cannot be said for the rest of the committed supports. They mostly just support the film’s sustained torture for its protagonist. But that consistency is admirable. Moreover, the unexplained elements push the narrative further into the gorge between absurdity and believability. Ayoade and co-writer Avi Korine’s adaptation of Fyodor Dostoyevsky’s novella is decidedly loose. The director is instead committed to establishing his own nightmarish vision. Sensually, the film succeeds. Production design is palpably rigid. The color palette isn’t desaturated, but Erik Wilson’s cinematography is soaked in a purposefully tight portion of the spectrum. Scenes are as dark and otherworldly as the action they depict. Hard, deep piano notes resound somberly in Andrew Hewitt’s sharp, haunting score. This is a dreamlike film that feels as alien as the world it depicts. Ayoade masterfully contrasts the uniformity of the production with the irrationality of the subject matter. Simon feels like he’s trapped outside of himself, sealed out of his own life. His double embodies that feeling. Yet, the film never feels manipulative despite the empathy it evokes. Through his clever foreshadowing, Ayoade helps to set up some striking echoes that underline the mirroring premise. 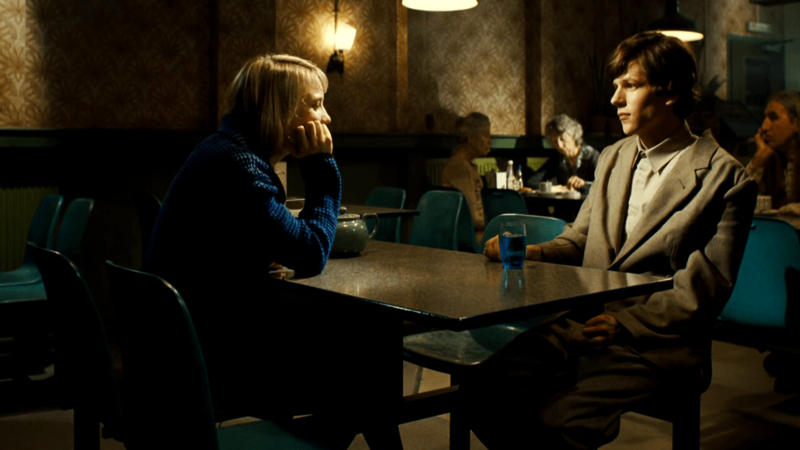 The Double is a disturbingly suffocated film. It’s a cinematic exhibition that thrives in its claustrophobic production sensibilities. It plays like a sustained held breath and a wildly frightening trip. It is uncomfortable and blatantly off-kilter, but its darkly subversive humor keeps it firmly soldered in the mind.